01/08 - (Michigan) — An owner of a local custom sound business says he can’t believe how many calls he has received about a potential stereo equipment scam occurring in the area. Since last July, Rod Carter, owner of Carters Custom Sound, estimated he’s been called 75 to 100 times regarding a scam in which people buy merchandise from someone with a van full of bad stereo equipment. Within the last few weeks, he said, he’s had five calls from people who fell victim to the scheme. The people selling this equipment try to catch others coming out of banks or places where electronics are sold, Carter said. Their selling pitch usually involves a claim about unloading extra new stereos they have. In addition, they tend to present only one or two pieces of equipment at a time even though they might have a van full of equipment. The merchandise is then sold at a fraction of what they say it’s normally sold for, and typically the sellers take cash payments. Since Carter’s business provides electronic equipment services, he said those who fall victim to the scheme often come to him wanting help with the faulty equipment. Carter said he remembers watching a news program about five or six years ago about a similar scam and noticed it had picked up again about a year ago. “There’s a lot more of this going on than people know,” he said. Carter has heard of people paying from $300 to as much as $1,500 for the equipment, which he said doesn’t even work 80 percent of the time. To add to their credibility, Carter said, the people selling the equipment make up fake invoices. “These guys are smooth. And are so good at what they do,” he said. Lt. Cletus Smith of the Lenawee County Sheriff’s Department said the department has received a few tips about the scam. Smith said he has seen this scheme before and believes it’s coming from Toledo. He said the department doesn’t have any open complaints. “Right now, we’re seeing an increase in fraudulent crimes,” he said. When the APD receives those calls, he said, often the sellers have purchased vendors’ permits to sell their equipment legally. He suggested that people buy electronic equipment from a reputable store and not from the back of someone’s van or pickup truck. “The quality isn’t there,” he said. If anyone does see something that looks “wrong” or illegal, he said, they should contact the Adrian Police Department. 11/08 - (MI) - Buyers on a budget, beware. Elkhart County Police say some scammers are hitting local shopping plaza lots, hoping to make a few bucks. Several calls have come in from customers claiming to be scammed by sales people in white vans. The sales pitch to buy a home-theater system repeatedly sounded too good to be true. There's a website, genesismedialabs.com, showcasing the must-have home theater system. Part of this pitch is the so-called "over-stocked merchandise" needs to go at cut-rate prices. There's been no mention of prices, but police say they're being sold by scammers in parking lots all over northern Indiana and southern Michigan. Specifically, Lowe's in Goshen on US 33, a plaza in Three Rivers, and the Ligonier-Kendallville area. Buyers are handed a brochure making it believable, Genesis Media Labs has "superior audio products" as their website states. We showed, Roger Rosenberg a copy of the website home page and asked if approached, would he buy? He said, "Probably, so yeah you can't blame the normal person for at least considering it." Rosenberg said he had already heard about this scam last week from friends. The merchandise has turned out to be of poor quality despite what buyers are told when sellers quote the manufacturer's suggested retail price. Police say the scammers are driving around in white vans. Dominic and Lynn Mattea say, "It's really sad especially with the economy and our local economy as bad as it is, people have been laid off and really don't have money to waste on something like that." Rosenberg says, "I think you have to stay some place where the name is reputable and trust that it's going to be a good product." The website says Genesis Media Labs is based out of Los Angeles. There is no phone number to call, so we sent an e-mail. We'll let you know if we get a response. The old "White Van Speaker Scam" has moved onto craigslist - The same brands of suspicious speakers are being talked up with great new sale lines. They are accompanied by extensive technical jargon that actually means very little or is flat out false. The guy varies his name and phone numbers, but the formatting of the listing is quite obviously done by the same person, insisting that he be contacted by phone (for whatever reason). "I am selling a pair of very nice, Acoustic Response A/V Monitor floor speakers, Series 707. These sound very good! But I've purchased a larger set of Vandersteen speakers." "Sensitivity: 97 dB / (2.83V @ 1 meter) That is a very high rating. Measures conversion of power to sound." While the technical specs below ( placed by a "Speakerman" at a review site where he tried to bump up the ratings with planted "unbiased" reviews ) sound impressive the more technical purchasers dig a little deeper into what they actually represent. Dual 8" Floor-standing 2-way Tower Speaker Utilizing a 4th Order Butterworth Ported Design - 15 Watts RMS Amp Power, 200 Watts Music Power, 8 ohms, 91B 1W/1M, 100dB, 39-22,000 Hz (+-3dB), 12/6 dB per octave, 4,000 Hz crossover, 2-8" " High Modulus" Bi-Lamented Cone Butyl Rubber Surround, 1 1/2" Dia. High-temp Voice Coil, 24 oz. High Strength Ceramic Magnet, 13mm Titanium Coated Dome Computer Opt. Phase Dispersion Ring Tweeter, all in a wood black veneered finished ported cabinet. "The speakers were weak, and could not compete with my ten year old stereo and speakers. He told me once I buy some 12 gauge speaker wire to hook up to them, they would blow me away. After the rewiring, I have not been blown away and I am disappointed." "I decided to find out for myself just what these speakers were made of, so I proceeded to disassemble them. The two way crossover is very insufficient and not capable of handling what the speaker says. No insulation was placed on the inside to help with bass reproduction. The speakers have weak magnets and no specifications on them. The cones appear to be a polymer product, but when flipped over they are not. All in all, I paid for a speaker box and a nice speaker plug." "I have personally believed that either the Bose AM series or their VCS was the single worst speaker listening experience that I have ever heard from a non-blown speaker, until I heard these." "I unscrewed the drivers from the enclosure, these drivers look like they were made by some cheap manufacturer in Taiwan or Hong Kong. The cross-over network contains of some cheap and simple elements. The wires were thin and they weren't even soldered onto the driver. They were clipped on." "When I pointed out these speakers had dodgy rubber rims and were crappy paper cones, and the titanium tweeter was in fact aluminum, the guy got really shirty and said he was in a hurry." "On the box it says "Computer optimized crossover on Military spec PC board" but when you open it, There ain't no stinkin' crossover PCB. It's got a single capacitor in series with the tweeter. No circuit whatsoever on the bass cone." "Their so-called "patent pending" grill design - I thought it was always better to listen without the grill- it's nothing but a piece of wood with black cloth over them. Bass drivers are not flush with the baffle. Even cheap $100 speakers do that." "Cabinet is made out of cheap low density particle board, and is empty, resonating everywhere. No stuffing, no nothing. They used cheap 20 cents/m connecting wires." "They produce terrible sound quality and are manufactured from extremely low quality components. Just reading their spec from their "website" is enough to tell anyone that it is a load of cobblers." "For example, if anyone can tell me what a "Controlled DirectivityT integrated grille" is, other than a couple of slats pointing in a particular direction then I would be amazed. Ditto "High ModulusTM treated cone with butyl rubber surrounds" - other than a polypropylene cone that is no longer used in credible woofer designs." "These speakers don't even qualify for being in the lowest common denominator mass market category. They are even lower than that. "If you are one of the rare folks who do like the sound, I advise that you go to Wal-Mart or Dollar General Stores first. 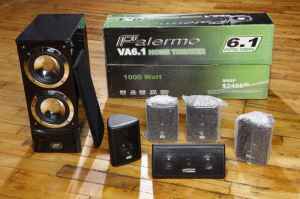 You'll find better speakers from Yorx, Emerson, or Symphonic for less than $50.00 and that includes the rest of the system." "I took them home and hooked them up. The bass was strong - in fact I had to turn down the bass on the graphic to test the high range. About ten minutes of playing and one tweeter stopped working. I took them apart to investigate." "The spade connector had fallen off. Inside, they are as cheap as the outside (about the same quality as my AUD$200 Wharfdales. Tiny wires, slip on spade connectors, but they do have a pcb with two inductor, two capacitors and two high wattage resistors." "I did not analyze the filter, but it probably is fourth order Butterworth as in the specs. There was some black baffling inside for damping. The cases are just particle board, and the screws are already pulling out." "He pulled out a magazine and flipped to a marked page and showed me an ad. I've seen this ad before because I read HiFi magazines quite often. The ad was for a HiFi store that deals in very expensive equipment. There were names like Bryston, Wilson Audio, Cary, Dunlavy, etc." "There right in the middle was Magnum Dynalab. In the layout of the ad, they had to kind of offset the word Magnum from the word Dynalab. I said that this is in fact MAGNUM Dynalab and it is a company that deals in power conditioners and stuff. They have never made a speaker. Actually they should sue, if you ask me!" - kindly submitted by Le Saint, of Montreal Canada. Do you want to make money? Does the thought of bringing home a $1,000 a week while having the time of your life interest you? It's easy as long as you (1) have a legal business license for the town you intend to sell in, (2) work for the local stereo speaker scam company, and (3) want to make money! Here you will learn to pick the best target to sell to. Within the business, these people are referred to as "hits." For obvious reasons, the ideal person to choose is the single male, age 20-35. These particular individuals seem to enjoy their electronic gadgets, regardless of cost, and the more high-tech they sound, the more they want them. Men in expensive cars and trucks are the best to choose because they don't mind spending the extra money on nice things. Preferably, these men are driving alone because when there is more than one person in the car, it makes it twice as difficult to focus your energy and influence on the "hit." Also, the other person can have time to think about what is going on and may clue in their companion. Avoid the elderly! Unless they seem to be particularly hip, the majority of the population of over-60 individuals in this country have no desire to spend their social security checks on big speakers. Also, you may be putting all of your energy into the show that will have no results while the perfect hit is driving right past you. Wives and girlfriends can be dangerous to your efforts, as well. If you see someone fitting this description with your intended hit, pass on them unless you're feeling brave, because there is nothing more demoralizing than a spineless man who after buying into your whole story says "I love these things, but let me go ask my wife." Ninety-nine times out of a hundred the man will return, crestfallen to inform you that SHE doesn't want them. A single woman in a car is a different story, however. While never as easy to sell as a man, women can also be convinced that they need speakers, but remember that you cannot be as aggressive with the sale. This is the most important part of the entire process. The pitch is which you quickly (since you may be speeding down a road yelling out the window) tell your hit what you have to sell and why. The story that you use is always the same. Why? Because we have been in this business since the seventies and it works! The pitch must be given with all the excitement that you can muster. Remember, you are trying to convince your hit that you are sitting on $6,000 of surplus equipment.
" Hey man, hey guy! Want a big set of speakers for your house? I work for an audio company and they just overloaded me!" The majority of the population has an attention span of thirteen seconds before their mind begins to wander. This is because everyone is so used to the short spot commercials they see all day long on TV, so make it quick. After shouting out the pitch, follow it immediately with "Pull over and I'll show you!" Always tell your hit what to do. The concept is to take control of their mind, making them think in an ordered way as you follow through your routine. Therefore you never ask the hit to pull over, because they have the option of saying "No." Just tell them to and you will be surprised how many people follow you to the side of the road. This is the time to let your dramatic skill shine. You are about to bring the hit to the van and actually show them the product that you are trying to sell for much more than its worth, so you must be convincing. You are only supposed to be a delivery driver who got overloaded, so don't act too knowledgeable about the speaker. You will be give a spec sheet that has the dimensions of the speakers and false power ranges and additions that do not exist, but they won't know this. All they see is the shiny, laminated, professional looking sheet, and you. When the hit gets out of their car, bounce up to them and grab their hand, shaking it while explaining the following story. Be sure to include any possible detail that you think might have occurred, since it will make your story much more believable. If you just won the lottery, I bet you could tell someone everything that happened to you that day, minute to minute. You tell the hit that you arrived to work in order to pick up your daily deliveries, and someone in the confusion of the morning accidentally doubled your order since regular speakers come in pairs, but the "special" studio monitors that you have actually sold individually. Treat the hit as thought they know more about everything than you do. Build their ego and they will become your instant friend. While at the warehouse, the foreman signed the invoice (an imitation copy given to you every morning at the office), and you left with the extra speakers. Make your boss out to be a real hard-nose, so that they feel bad for you, the minimum wage earner, and forget about the moral side of the issue. You need to bring back $200 for each pair sold, but the suggested retail price on the spec. sheet is $850 apiece, so you have a lot of leeway since all other money over $ 200 is your to keep. While talking non-stop the whole time (don't give them time to think) occasionally shove the spec sheet in front of their face for emphasis, but not too often or the hit will concentrate on the sheet and your words will lose their emphasis. Now show them the speaker, all the while telling them of the different interesting things that these "professional quality" speakers have that others don't. 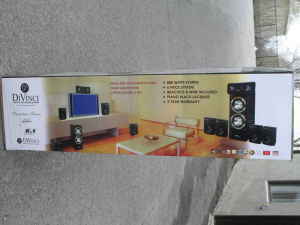 Remember, these people did not leave their house with the intention of buying any speakers that day, so it's up to you to convince them that they need these things. Always look them in the eye, as well. It may make them nervous at first, but once they become caught up in your voice they will see you as less shady. Tap the woofer of the speaker to show them the quality of the polypropylene, but not too hard. In order to make it sound more solid, hit the wooden box of the speaker with the palm of your while your finger taps the woofer. After going over the other qualities of the speaker, it's time for the sale. If the guy is still there at this point, you've got him interested so close the sale and get your money! The easiest way to reach this point is when you finish the whole story immediately follow it with "So Bill (always use their name if they tell it to you), what's the most you can do?" Then STOP! Do not say another word. This is the only part of the show where silence is golden. You have asked the buying question, now leave it to the hit to bring up a figure. Wait five minutes if you have to, all the time staring at the hit with an expectant look on your face. After receiving his offer, blow it out of the water with a ridiculous over-offer. You never know how much money your hit can get his hands on, so don't cut yourself short. Pitch 'em high, look 'em in the eye, and watch 'em buy. After haggling ("Come on guy, I know what these are worth, I'm not gonna just give 'em away! What's the most, most, most you can do? "), decide on how much you can get out of this person, and once your reach that figure, immediately say "Where do you have to go to get the money?" As you say this, grab his hand again and shake it as if you just sealed the deal, pick up the speaker and start walking it to his car. If the door is unlocked, o pen it and stuff the speaker in. If the hit had any doubts about the status of the sale, they are gone now. This is called "the slam." If you are working with a partner, ask the hit if you can ride with him to the bank, already assuming that you are going there: "Not that I don't trust you or anything, man, but you know how it is." Have your partner follow the two of you in the van, in case the guy tries to flee with the goods. At the bank, get out and follow him to the ATM, teller, or whatever, and stand right next to him, all the while talking about something other than the sale, so that he does not think about the fact that he is about to take out hundreds of dollars for something that he doesn't need. If you happen to see that he has more money in his account, don't be afraid to make a scene accusing him to trying to scam YOU: "Hey, guy, come on, these are worth almost $2,000 a pair and I'm giving them to you for $600 (a $400 profit under the false front of a good deal), you can do another fifty bucks." They may buy this, they may not, but it's worth the try, and the sale is technically already over so it's hard to screw up at this point, since you are in control. You have just successfully made $400 (which you split with your partner) for fifteen minutes of work. Not bad! Of course, the majority of your pitches will not be successful, but the more you pitch, the more you sell. Happy Hunting!